Cover Love at Romance Lives Forever is a short intro to a book and includes a cover, blurb, buy links, and social media contacts for the author. 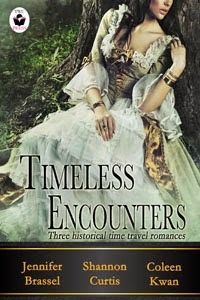 Today's featured book is Timeless Encounters, an anthology by Jennifer Brassel, Shannon Curtis, and Coleen Kwan. The Tipping Point: Returning to Ashwood House, the accursed money pit that destroyed her marriage, catapults Bella and estranged husband Reuben into a past where both have the opportunity to make different choices. If they dare. The Black Gordon: In pursuit of a serial killer, Brenda is held captive by The Black Gordon, a handsome warrior intent on stealing more than just her freedom. The Photograph: Whilst crossing the threshold into her doppelganger's enigmatic past, archivist Erin discovers the key to her own future, answers to her past, and heals the heart of a man wounded by tragedy. Welcome, everyone! Hope you have a fun day. I agree about the cover. It's gorgeous. Would love to know who did it. You did a great job! Thank you for letting me know.